Having a great cast doesn’t always lead to a great movie, but there certainly is a tremendous pleasure that comes from seeing two of the industry’s most charismatic performers work both with and against each other on the big screen. 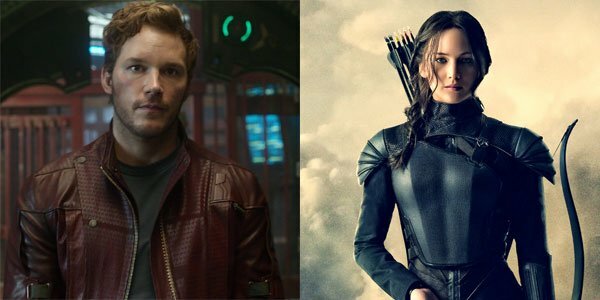 Two perfect examples are Chris Pratt and Jennifer Lawrence, and if our first look at their recent collaboration, Passengers, is any indication, the film truly should be dynamite. Sony Pictures took over the stage at the Colosseum in Caesar’s Palace on Tuesday night for their presentation at CinemaCon – the annual convention held in Las Vegas for theater owners – and while the studio showed off a diverse slate of movies set to come out in the next year, none left a bigger impact than Passengers, which comes to us from director Morten Tyldum (the Oscar-nominated filmmaker behind The Imitation Game). The sci-fi film somehow manages to look both bold and ambitious while also tremendously intimate, and it’s now firmly on our radar as we look forward to the rest of 2016. The footage began with shots of a giant ship flying through space – the text on the bottom of the screen telling us that this is the Starship Avalon, and is currently making a 120 year journey to Homestead 2 with 5,258 passengers on-board and in hyper-sleep. That last number suddenly decreases to 5,257, however, when James Preston (Chris Pratt) wakes up after his pod malfunctions and opens. In his tiny living space he gets dressed and groomed, and prepares to meet the other people on the ship and start his new life on Homestead 2. Unfortunately, he comes to the realization that everyone else is asleep and that he has woken up 90 years too early. With nobody else around, James tries to keep himself entertained, but struggles with not only being alone, but also having limited access to the ship’s functionality because of the low class of his ticket (there’s a great sequence where he runs through a series of options on a coffee machine and is repeatedly denied, ultimately having to settle for just a large regular coffee with no milk or sugar). He discovers a "friend" in the form of an android (Michael Sheen) working behind the ship’s bar, and keeps himself entertained by tinkering with machines – he’s a mechanic – but it’s very clear that he’s leading an empty life. Of course, that all changes in an instant when he discovers Aurora (Jennifer Lawrence), another passenger whose pod has malfunctioned and wakes up too early – specifically a year and three weeks after James. At first they try to work together to try and find a way to get themselves back into hyper-sleep, but when that proves to be impossible, they instead commit themselves to living the best life possible – eventually starting a romantic relationship. Things don’t stay happy for long, however, as the pod malfunctions start to be only the beginning of the Starship Avalon’s issues. For example, there is an absolutely terrifying sequence where the gravity is shut off… which wouldn’t be a huge issue if it weren’t for the fact that it happens while Aurora is swimming in a pool. After diving deep down, she tries to resurface for air, but finds herself still completely trapped in the water – and floating in midair. It turns out that the ship is on the verge of a serious crisis, and if James and Aurora don’t do anything about it, it could wind up costing the lives of more than 5,000 people. Given that Passengers won’t be out until December 21st, and that that a lot of the visual effects were far from done, it will probably be a little while before Sony releases any footage from the movie – but I’m telling you now that you need to start getting excited for this one (if you weren’t already).